When I first started out with my Silhouette I only bought the basics that I needed from Michael’s Arts & Crafts. I figured that I would pick things up as I went, which was a good plan at the beginning since I didn’t really know what I’d be using the machine for. There are so many different Silhouette Cameo tools that you can buy, it really just depends on what you’re going to make with your machine. 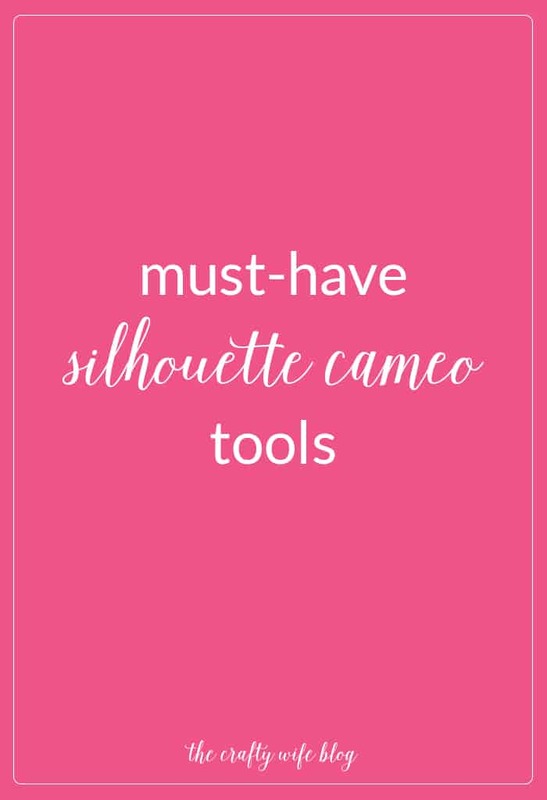 Even though there are a ton of different Silhouette cameo tools you could buy, I made a list of my favorites. They are ones I use the most and have extras of. To be completely honest I’m a bit of a silhouette tools hoarder. But hey, that usually means I have things on hand when making something new and I don’t have to run out to the store to get whatever I need. And I have to admit that’s a huge bonus to having your home taken over by craft supplies! Whether you’re working with vinyl or paper, you will definitely need this Silhouette Tool Bundle ! They help you pull up any excess material that you won’t need with your designs. When you buy your Silhouette machine you are able to access the design studio. This is probably the most important tool you can have when working with your silhouette! You can buy different designs through the Silhouette store or design your own. If it takes you a while to fall in love with your Silhouette machine like I did, then you probably won’t need extra blades and mats right away. But once you get going and start crafting with it all of the time, it’s a good idea to have backups. Especially if you like cutting a lot of glitter paper. Because glitter wreaks havoc on your blades ! As a side note, if you’re using a new mat make sure to dab it with a clean cotton cloth! New mats are extremely sticky and it will ruin your vinyl or paper when you try to pull it up. I love my sketch pens, and am slowly starting to use them more and more in projects! If you love scrapbooking they’re a great asset, but I love using mine to write on tags or make coloring pages. I have a post I’m working on with my favorite fonts to use with the sketch pens ….because there are so many great ones that you can use! There are two types of vinyl I use: heat transfer and permanent. I love making onesies for my little guy and I even made my little sister’s bridal shower gift with heat transfer. I buy all of my heat transfer vinyl from here, super fast shipping and it’s a great product! For my permanent vinyl I always get it from Amazon (with Prime I always get two day shipping! ), and I almost always buy it from Expressions Vinyl . That’s the type of vinyl I use on canvases and glass blocks. I’m just now getting into sticker making with my Silhouette and I am super excited about it! I need to go buy new ink for my printer so I can try it out, but the idea behind it seems easy enough. Make sure you have full sheets of sticker paper as well as ink in your printer. They call this type of project a print and cut and I cannot wait to try it out! You know, I’ve tried the silhouette brand transfer paper and regular contact paper (per someone’s suggestion) and nothing is better than the silhouette transfer paper ! The Silhouette brand sticks so well to the vinyl and makes it so easy to place it on your project. Contact paper has never stuck to the vinyl so I just gave up on using it. I’m not a huge scrapbook person but if that’s what you’re going to use your Silhouette for you will need to stock up on pretty paper! The best time to buy scrapbook paper is when Michaels Arts & Crafts is having a sale on it, so I always stock up whenever that happens! So those are my eight favorite tools to use with my Silhouette ! What are yours? Did I leave any out?